Earlier this week, we had four of our five grandchildren staying with us. Dylan couldn't come because he was away at EAA Air Academy camp. They were all very good kids but oh so LOUD! We barely speak in our house. My husband has heard all my stories over the course of nearly fifty years and I have heard his. I lived with dad until I graduated from high school and then talked to my mom every day until her death. There may be a few stories that haven't been told, but not many. The kids chatter much of the time. They love their electronic devices. They try to explain what they are playing and how it works. I usually don't have any idea what they are talking about. We confiscated all the electronics before bed on Monday night. The allure is way too great, even in the middle of the night. The only one spared from the electronic addiction is the four year old. He still plays with actual toys. The downside was that our only granddaughter has her alarm set on her ipod. It went off at 5:30 am and then every 10 minutes until she got up. I couldn't shut it off. She has a code that has to be punched in to turn it off or turn the volume down. I guess she needs to get up at 5:30 to get some alone time from her little brothers. I did insist they go out and play a little. They had fun with the squirt guns. 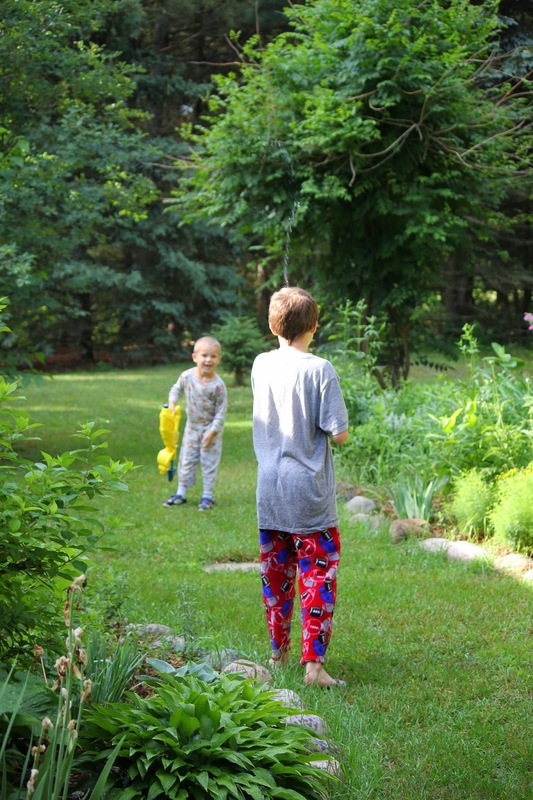 I let them go outside in their pj's because I knew they would get wet. 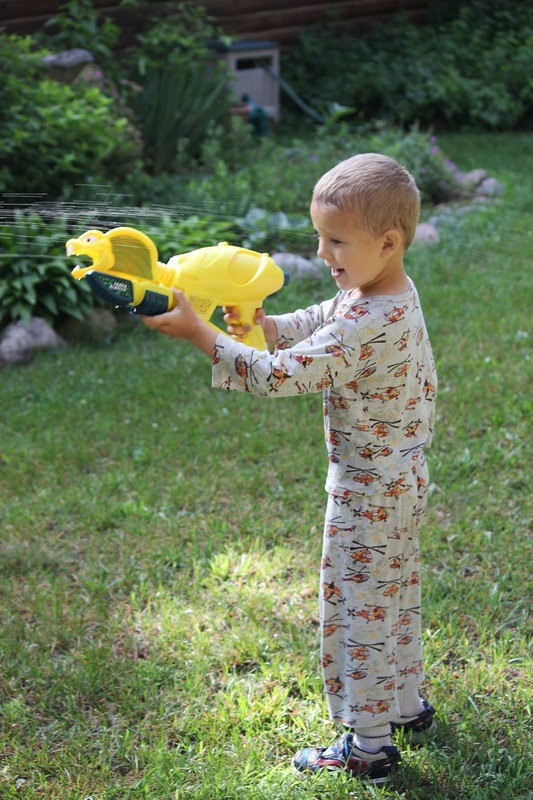 Later in the afternoon, we had round two of the squirt gun wars. I loved seeing them giggle and run around. The squirt guns were a big hit. They got soaking wet but it was worth it to get them outside. Melissa is almost 14 and doesn't want anything to do with all these boys. She found some skeins of yarn in my yarn stash. Then she found a sweater pattern on the internet and started to knit. She only did five rows but it kept her occupied. I taught her to knit several years ago, and she is good at it. She just doesn't have the patience yet. She wants the project to be done in a couple hours instead of several weeks. After supper, I took the little one to his mom and then we met my son in law for Melissa's softball game. As we were sitting there, the day changed from hot and sunny to cool and cloudy. Pretty soon, it started to sprinkle. The beauty of being a grandparent is that you don't have to sit through games if the weather is bad. Parents have to stay no matter what. As we headed home, the sky opened up and it poured down rain. As we pulled into the driveway, the sun came out again. As I walked into a quiet house, I saw a beautiful rainbow. It was a perfect ending to two very busy days.